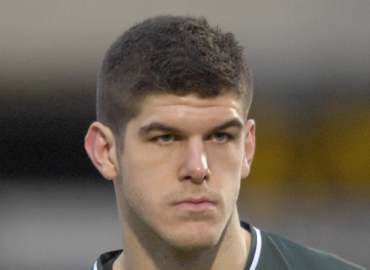 Fraser Forster off to Celtic? | NUFC Blog. Fraser Forster off to Celtic? Newcastle look like they are about to send one of their stars of the future out on loan for the whole season. Goalkeeper Fraser Forster was at Celtic watching them beat St Mirren 4-0 yesterday and is set to join the SPL outfit after a recommendation from Neil Lennon’s former team-mate, Paul Lambert, who had the 6ft 7ins stopper on loan at Carrow Road last season. I’m in two minds over this move to be honest. On one hand it could be very good for Forster, if he is starting in goal every week. But on the other hand, what is the point in sending the player to a team where he might just sit on the bench? The lad is at a point in his career where he needs games to develop, and I’m not sure whether he will get them at Celtic. I don’t know what the goalkeeping situation is like at Celtic to be honest, or how likely it is that he will be the first choice as I don’t watch Scottish football, it doesn’t interest me one little bit. I just don’t see the point in us loaning a player out to sit on a different bench. I would hope that any deal would include the option for us to recall the player at short notice in the event of injury to Steve Harper or Tim Krul although I doubt such details will be revealed until the deal is signed and sealed. Looking at it from the perspective of our squad, I would prefer to keep Forster with us. To me, Steve Harper is looking a little bit ropey at the moment, and taking some competition away from him may remove that little bit of doubt in Harper’s mind. He knows he has two top class young ‘keepers breathing down his neck, and if one goes somewhere else then he may feel that the pressure is off him a little bit. I don’t want to be too down on Harper. It would be harsh to be down on any player after our 6-0 win yesterday, but Harper hasn’t filled me with confidence for a good few months now. He seems to be that split-second slower at reacting to things which is causing sloppy errors. If my fellow Hexham lad, Fraser Forster does end up at Celtic, I hope Harper sees it as a leep of faith from the manager and not a free ticket. If I was Steve Harper, I’d be a worried man. If he’s not going to be first choice then we should have let him go bo back to Norwich where he was.If he goes out on loan we need to be able to recall him at anytime…if thats possible? Yeah it’s possible Rich. Usually 24 or 48 hours notice. that ok then,still think he should have gone to Norwich where he was as good as guaranteed a start. Was nice to hear Barton getting some backing from the press earlier. That NOTW dude, Sean Custis? ?, was saying it is outrageous what some of the press are making out with Barton and his tache when nearly everyone knows otherwise. Anyone noticed that the Nufcblog fantasy league is the 45th highest ranked out of 193,418 private leagues, not bad at all! You guys obviously haven’t seen Zaluska. Total bombscare. This guy will get his game. any news on hba ?? Good to know Neil, is he their first choice normally then? Neil…..if thats true then it will be a good move then as I’m assuming it will be the same as the Norwich deal where he still had to train with Newcastle 1 or 2 times a week,so the travel would certainly be easier for him. If the big lad is as good as he has been spoke of he will get every chance to nail down the first choice spot. If things go to script we should have a decent run in Europe so would be good experience for your young goalie. The only hitch I see from what is written above is the call back situation mentioned. You cant recall international loans. I would expect Forster to be frist choice within a few weeks. We sold Boruc this summer and had hoped that his fellow Polish Understudy (Lukasz Zaluska) would fill his shoes, but he has been a bit of a bombscare and will be replaced. Think the 1 year loan suits us as we are expected to sign Kieran Westwood from Coventry on a pre contract in January. alrite boys… i just woke up with the biggest smile on my face in a while!!! lol… just hope newcastle keep there heads down and dont lose at wolves. i’d happily take a draw, will be a scruffy match with a defo red card. best of luck to forster!! i agree with every1 about steve harper… very suspect but chris hughton will no this… his job is more to him then player loyaties ans steve will no he has to book his ideas up…. is ben afra a dead deal?? hmm how about a 6 month loan with Celtic ? Will be a good move for him. He will play under real pressure and it will stand him in good stead. See him as a future no 1 here. Aye Stuart,for us and England. Foster to Celtic is a great move for everyone, Celtic, the lad himself, and also the toon. If the current Celtic goalie is as bad as he’s made out to be FF is gonna get a lot of games this year, European games too probably. Can only help bring the lad on.